As with so many of the sub-disciplines in art history and visual studies, Renaissance and early modern studies has seen a flurry of publications on the history of emotions and culture. 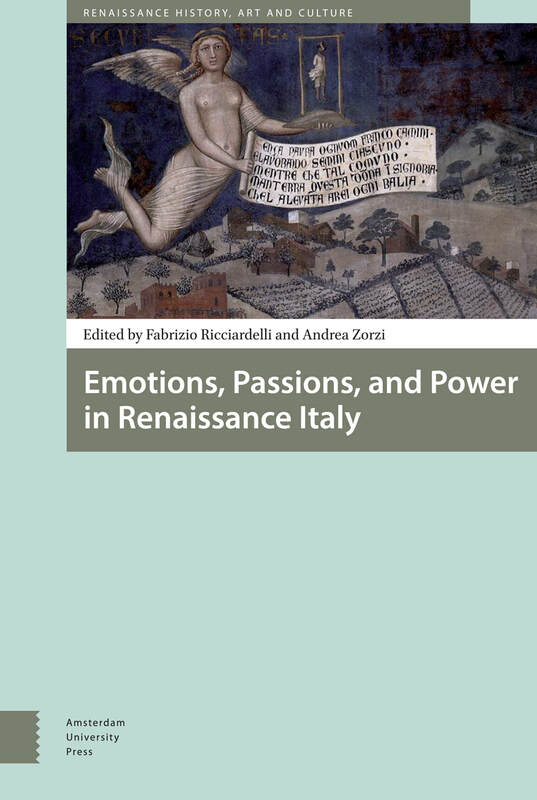 The volume of twelve essays edited by Fabrizio Ricciardelli and Andrea Zorzi emerged from a series of academic conferences and roundtables devoted to the theme of emotion, passion, and power in Renaissance Italy. The book is framed by Barbara Rosenwein’s significant essay, “The Place of Renaissance Italy in the History of Emotions,” which opens the discussion. Her 2006 book Emotional Communities in the Early Middle Ages, which was preceded by Peter and Carol Stearns’s Emotionology: Clarifying the History of Emotions and Emotional Standards (1985), advanced the study of “emotional communities” in pre-modern Europe. Here, the goal of the individual essays is to investigate a variety of cultural practices, including visual imagery, as they were shaped by the intricate interrelationships of passion and hate, as well as experiences of distress, fear, joy, and shame, within the complex social worlds of the Italian city-republic between the thirteenth and fifteenth centuries. The volume edited by Jennifer Spinks and Charles Zika emerged from an exhibition at the National Gallery of Victoria, Melbourne (2012), the subject of which was further explored at an academic symposium. The project was developed under the umbrella of the Australian Research Council Centre of Excellence in the History of Emotions 1100–1800. 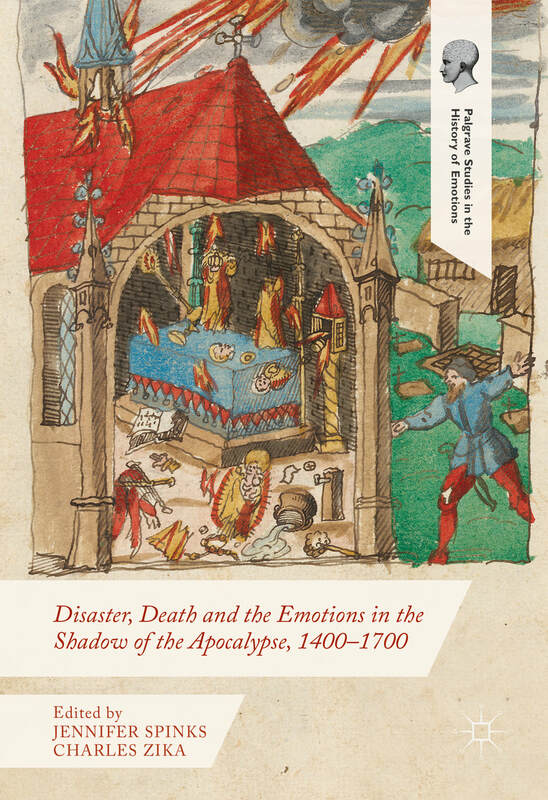 This important volume examines the impact of disaster on human emotions from 1400 to1700. Its sixteen essays examine the links between natural and human-generated disasters, including war, climate change, floods, and earthquakes, all of which led to complex cycles of want, deprivation, grief, and fear. The themes of the Apocalypse and the Last Judgement provide an anchor for an analysis of the emotional terrain of fear and desire, which was inevitably shaped by a Christian worldview, and were used to make sense of disorder, disaster, and death. Both books offer a rich tapestry of insights into the crucial role that emotions played in shaping European understandings and responses within the unruly world of urban politics, as well as ongoing reactions to disaster and upheaval, human or natural. Rosenwein’s essay outlines nineteenth- and twentieth-century theories about Renaissance emotions and practices, and locates the field within a fourfold structure that aims to ground the discussion of lived emotions from the past within specific historiographical traditions, such as Jacob Burckhardt’s views on individuality and the emergence of emotional expression as a striking feature of the Renaissance (1860). She then examines the contribution of Norbert Elias, whose book on The Civilizing Process (1939; 2000) argued that violent emotions and impulses were gradually brought under control in this period. She also identifies a third strand: a performative approach to how emotions are constituted. As she notes, this model, generated by J. L. Austin (1955), has been the most influential for scholars in recent years. Finally, she notes the importance of the “linguistic turn” in studies of emotion, thereby helping us to see the range of affective language in Renaissance Italy. She asserts that scholars should examine the emotional norms, practices, and vocabularies of various emotional communities in Renaissance Italy, as well as in other parts of Europe. Building on this influential essay, Andrea Zorzi examines Tuscan illustrated manuscripts, together with two fresco cycles, and relates them to the expression of a collective sense of turmoil and social unrest. For instance, Zorzi suggests that the “sweet life” depicted in the frescoes of Good Government in the Palazzo Pubblico in Siena is, in fact, indicative of a deep sense of social unease and gloom in the face of natural disaster, economic crisis, war, and political division. Gennaro Ferrante’s essay on the texts and visual objects used to comfort prisoners preparing for execution and the Day of Judgement makes for compelling reading. Stephen J. Milner provides another key essay on the “affective turn” (with a bow to the work of Sara Ahmed): he examines the “affective economy” of the Italian city-republics, noting how emotions circulate within communities to create a sense of self in relation to society. He points to the centrality of rhetoric, both verbal and visual, as a technology of persuasion (in Foucault’s sense of the term) that marshals affect for audiences, thus indicating what should be pursued and what should be avoided. The bene commune or good of the commune was located in an intricate state of tension between collective ideals of charity and individual desire: learning to govern one’s inner state of emotions and passions was upheld as a way to build the common good, that is, the emotional capital of one’s community. In the first part of the volume by Spinks and Zika, key words, such as disaster, providence, emotions, and apocalypse, are explained. This provides the focus needed to establish how different European’s relationship to the natural world was before changes in outlook that emerged between the seventeenth and nineteenth centuries. As the editors suggest, they are particularly interested in delineating the ways that disasters influenced and sustained cultural discourse on apocalyptic thought. They suggest that, in reality, emotions drove much of the individual and societal reaction to momentous events in the histories of the period. As Alexandra Walsham shows, early modern prints and pamphlets visually expressed the belief that disaster was the result of God’s love for the faithful. These materials asked the reader/viewer to pour out their grief as a means of deflecting divine anger and retribution in the face of this type of divine love. In the sixteenth and seventeenth centuries, emphasis was placed on the public sharing of such sentiments, but over time, the discourse shifted to become more internal and individualized. Charles Zika examines text-image relations in a series of pamphlets created by a pastor in Zurich between 1560 and 1587, and demonstrates how emotions were fashioned in relation to the idea of an imminent End Time. As he points out, responses were complicated, with people wondering how to respond to disaster and whether the outcome was open to human influence. What emerges is a rich tapestry of emotions, characterized by a deep sense of unease and conflict framed within troubling narratives of time. In the second part of Spinks and Zika’s book, various scholars offer detailed case studies around different sorts of emotional experiences and responses. As the editors point out, the emotions of fear, as well as the many faces of violent reaction, permeate the discussion. Jennifer Spinks, for example, examines the visual and textual representation of prodigies and wonders in France in an era of religious dissension. Although cruel and violent acts against children are disturbing to modern readers, early modern individuals interpreted them as prodigious signs and indicators of the depths of human depravity caused by war, religious dissent, and civil war. Printed pamphlets, prints, and engravings relied on images of cannibalized children’s bodies as much as on unusual meteorological phenomena to express the contemporary sense of deeply traumatic experiences of religious violence. In the final part of the book, a series of case studies analyze the key role of visual media (manuscripts, paintings, prints, engravings) and their circulation in early modern Europe. One of the first visualizations of the bubonic plague occurs in the illustrated chronicle of Lucchese writer Giovanni Sercambi (1400). Louise Marshall demonstrates that these manuscripts, now in the Archivio di Stato in Lucca, were probably intended as visual records of the impact of the plague on the city. Likely readers include the Lord of Lucca, Paolo Guinigi, or, following his death, Sercambi’s immediate circle, all of whom had witnessed the disastrous outbreaks of plague between 1348 and 1399. The imagery features vivid signs of supernatural agents, such as angels, who participate in the economy of judgement and salvation, or demons, who unleash the disease on the human race. As she states, the horror expressed in these images is intended to move the soul and engender a state of penitence in the viewer. Their function is commemorative, hortatory, or cathartic, depending on the imagery on each page. Patricia Simons examines a number of Northern European paintings and prints illustrating the theme of Lot and his daughters, who escape the destruction of Sodom. As Simons suggests, the theme expressed important emotional truths, such as the idea that God’s punishment of the Sodomites was the forerunner to notions of selective human salvation. Dagmar Eichberger analyzes the engravings of the series Clades Judaeae Gentis (roughly translated as Scourge of the Jewish People) created by Maarten van Heemskerck in 1569, which illustrates the disasters encountered by the Jews in the Old Testament. One of the central questions for the artist was how to give a visual report of how the Jews, as a chosen people that fell out of favour with God, were affected by disasters and misfortune. His visual narratives demonstrate how pride, disobedience, greed, fraternal strife, and heresy influenced the fate of the Jewish people. No doubt he felt concern that his contemporaries might meet the same fate. This brief review can only signal the cornucopia of riches contained within these two volumes: there can be little doubt that both add immeasurably to our understanding of the complex history of emotions in Renaissance and early modern European visual culture. Catherine Harding is Associate Professor of Late Medieval and Early Renaissance Italian Art at the University of Victoria.